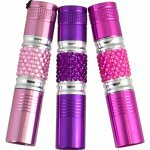 This stylish and slender LED flashlight attaches to the inside of a purse with a small carabiner clip so that it is always right where you need it. Use it to find items in your purse, as a key finder, and for safety. Requires 2 AA batteries.